Month to month online coaching includes customized plans tailored to the individual. USAT Level 2 Certified coach & USAT Elite Mentorship coach, discounts on lab testing, and sponsored products. Underwater swim filming and analysis upon request. 19x Hawaii Ironman qualifier, multiple USAT All-American triathlete, multiple top 10 overall amateur Ironman finisher. 6x National Champion in Triathlon (2x L.C. ), Duathlon (Standard & L.C.) & 2x Cross Country running. 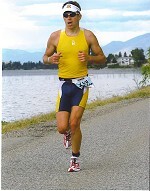 Competed in 30 Ironmans: Hawaii (13x), Brazil, New Zealand, USA, IM WIS, Florida, California, Arizona, Boulder, Canada, IM CDA. USAT Certified Level 2 Coach, ITU World Championships in Duathlon & Triathlon. Boulder Peak AG Champion, 5430 series AG Champion, USA Cycling Level III coach. Home: Boulder, CO. 2009 USAT Elite Mentorship Program Coach. Real Estate agent and dad. Heart Rate monitor, doctor clearance to train and preferably power meter. Success. Coach Kevin Konczak has been notified of your message.